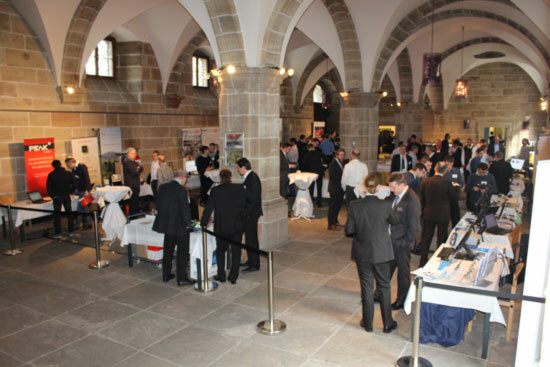 The two-day conference took place in Nuremberg, the hometown of the nonprofit CiA (CAN in Automation) association. About 100 engineers attended this event. The party is over. CiA celebrated its 25th anniversary during the 16th international CAN conference, which was sponsored by ESD, Etas, and HMS. Twenty-four speakers informed like 100 listeners about applications, upcoming technologies, CAN FD system design, and other topics. Overall impression: small conference with excellent on-side talks and an optimal option for networking. 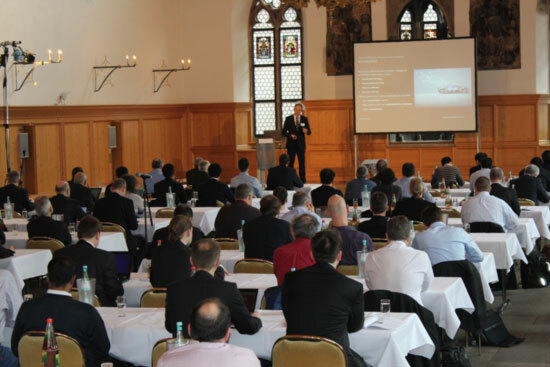 The conference started with two keynotes: One was a personal review and an outlook by Holger Zeltwanger, CiA Managing Director, followed by Christian Schlegel, another CAN pioneer, explaining the role of CAN in the age of Ethernet and IoT. Ethernet is used as backbone, but in the embedded control systems in vehicles as well as in the non-automotive industries needs to be scalable and reasonable in price. This is the business of CAN. Therefore, gateways and switches are needed. Roland Lieder from Renesas spoke about a gateway processor concept, which overcomes current limits. The approach is suitable for multiple Ethernet and CAN (FD) ports. However, the gap between 100-Mbit/s and Classical CAN is too big as stated by Dr. Marc Schreiner in his presentation. He required a faster CAN. The currently achievable 2 Mbit/s with CAN FD, is not sufficient for the future. Also others hope on 5 Mbit/s and more. One of the options is to suppress the ringing on the bus-lines. Denso had presented already at the last iCC its “re-active” ringing suppression circuitry” as specified in CiA 601-4. At this conference, Tony Adamson from NXP introduced briefly an “active” ringing suppression solution. In first tests, a robust 5-Mbit/s transmission in typical automotive topologies was achieved. Magnus Hell from Infineon explained the new wake-up pattern in CAN (FD) networks with selective wake-up transceivers: You can wake-up the nodes by means of CAN data frames, no special wake-up pattern are needed, was his message. Interoperability tests were another topic, presented by Christoph Wosnitza from C&S Group. He proposed an interoperability test framework for the CAN FD physical layer. CAN FD was also a topic for the upper layers. At the application layer, Dr. Schreiner sees a Multi-PDU concept as described in Autosar. At the lowest implementation layer Uwe Koppe from Microcontrol required a manageable CAN (FD) driver API (application programming interface). Ralph Knueppel from Airbus Industries reported briefly about the progress made in the CAN FD standardization for airborne applications within the nonprofit SAE/Arinc association. Besides CAN FD, CANopen was a topic in many presentations. Several papers reported about applications (e.g. remote-controlled skid-steers and seeding machines). Bernhard Floeth from Opel and Olaf Pfeiffer from Esacademy reported about some special issues of the CiA 447 (special-purpose car add-on networks) activities. Other CANopen-related topics included configuration file formats for boot loading and device testing as well as the XML device description format for CANopen FD devices. Testing and system design topics were covered and touched by many speakers. Manfred Brill from Schneider Electric drew the arc to FDT and OPC UA and Klaus Rupprecht from SYS TEC discussed the development solutions for CANopen Safety. Dr. Heikki Saha discussed in his paper, how to maintain CANopen Safety networks. He saw a degrading functional safety performance during the system lifetime, especially when exchanging of safety-related devices are not documented safely. Security was another topic popping-up in different papers. Bernd Elend from NXP presented an interesting solution on the physical layer. It is able to manage CAN-ID whitelists, to send error frames in case that owned CAN-IDs are transmitted on the bus, etc. This approach is not suitable for applications with dynamic ID-assignments. Therefore other solutions are focused on the application layers and above. Olaf Pfeiffer presented a scalable security framework for CAN-based systems. Other papers focused on time synchronization. Florian Harwich from Bosch explained the time synchronization as specified in CiA 603, which will be released soon. He also presented a first implementation on Bosch’s CAN (FD) cores. Hauke Webermann from ESD presented another hardware time-stamping implementation for transmitted and received CAN messages. Holger Zeltwanger summarized: “The future for CAN is bright, but some things are still to do.” He mentioned the 5-Mbit/s CAN FD challenge, CAN FD cable specification, an application layer independent safety protocol for CAN FD, and a common security solution for CAN-based networks. Another topic for the future is the specification of conformance and interoperability tests for all OSI layers as well as for devices and network systems. He said that the next iCC will take place in about two years depending in the progress made in open topics. By the way, the proceedings are available for € 65.